What's the first thing that you'll do when you visit a new neighbourhood in a new country? For me, it's the local mom and pop stores and deli. Rather the touristy places, I'm more interested to know where the locals go and what do they love. 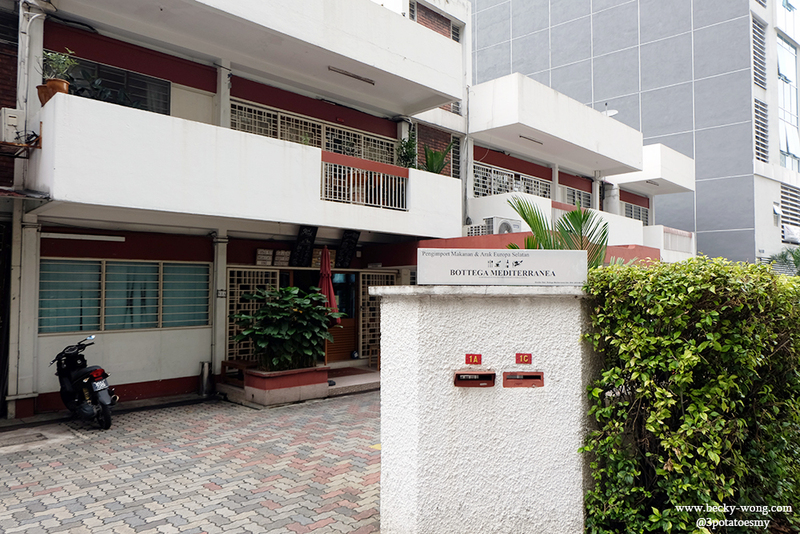 In Malaysia, we have A LOT of these places all over the country, thanks to our multi-cultural society and the amount of expats in the country. So, on top of the locals stores, we get to have a peek of the culture of the other countries through these stores - well, at least the food culture. 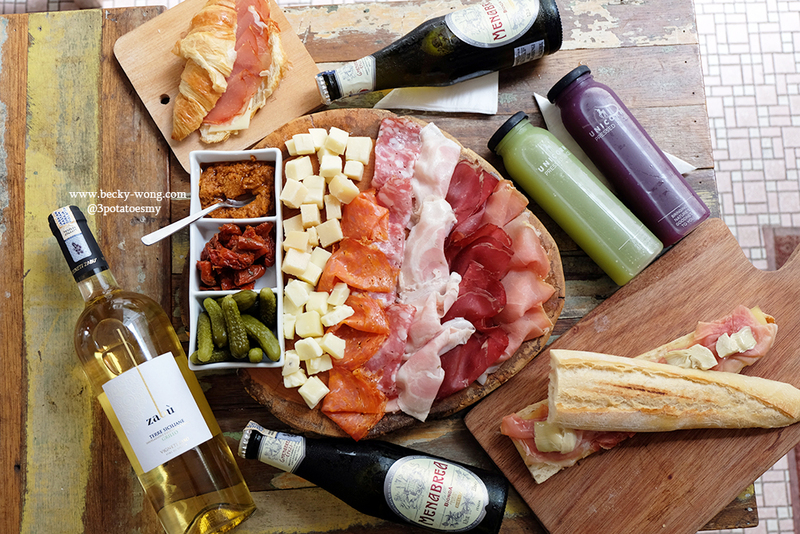 Bottega Mediterranea is one the delis in KL offering fresh products and authentic ingredients imported from all over the Italian peninsula. 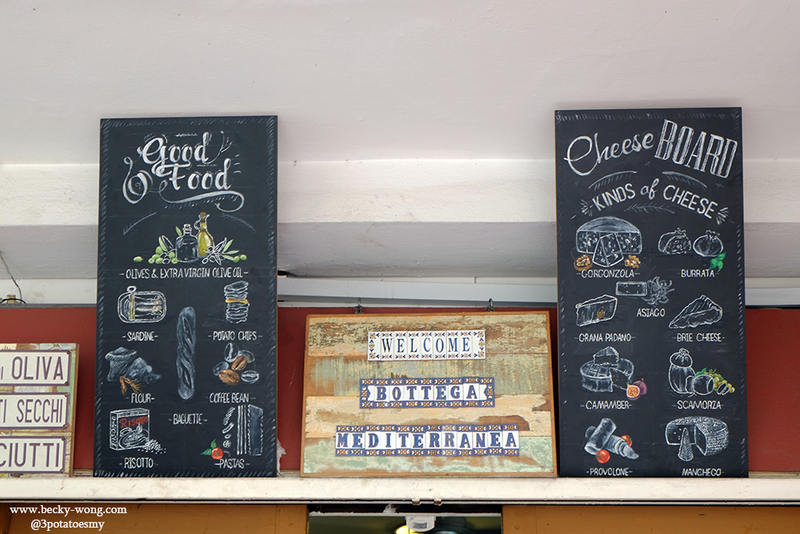 Located along Jalan Ceylon, the deli can be a little tough to locate. Look for Bijan, and the deli is right next door - a white colour double-storey house. Bottega Mediterranea reminds me a lot of those local delis I've been to in overseas. 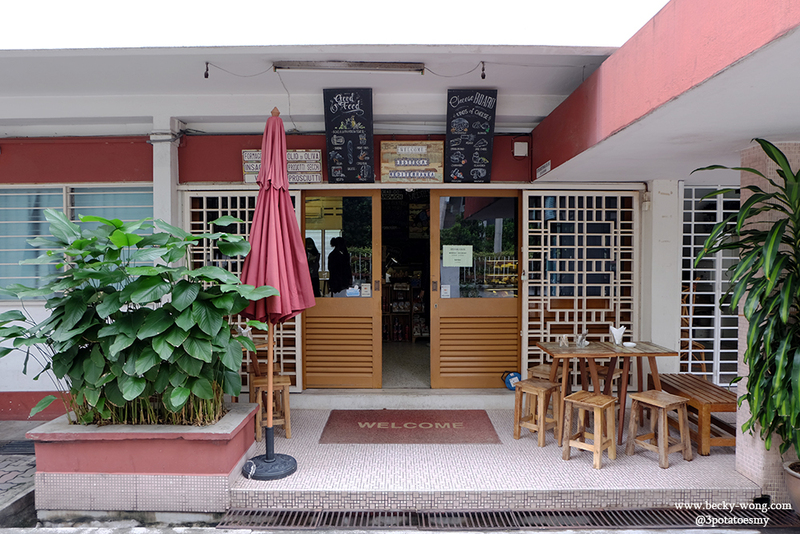 The place is very cosy and "homey" - something you would expect from your neighbourhood deli. 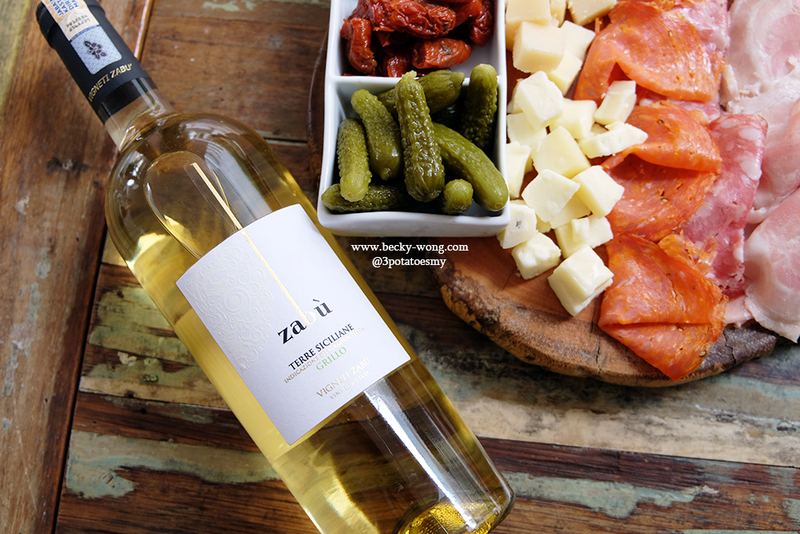 From olive oil, truffle oil, pastas, vinegar and many more - everything you need to prepare a delicious meal. They have cold cuts, cheese, wine and beer too! 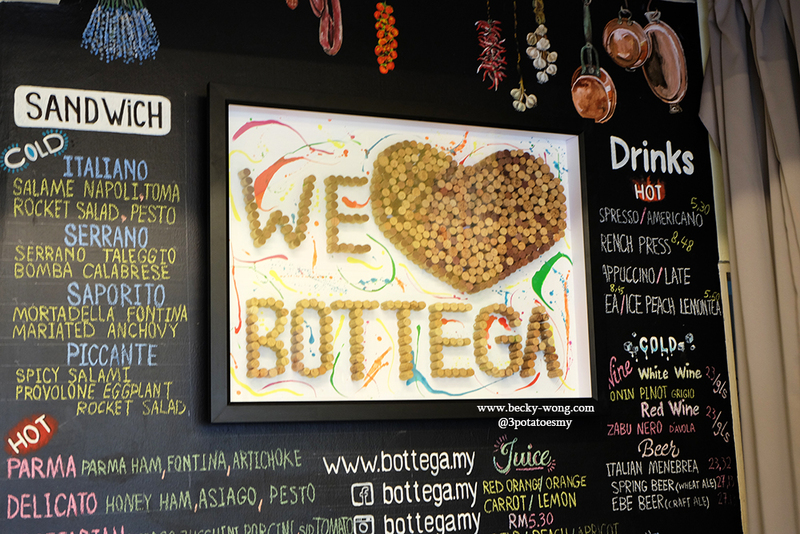 You can check out the dishes served at Bottega Mediterranea on the wall. 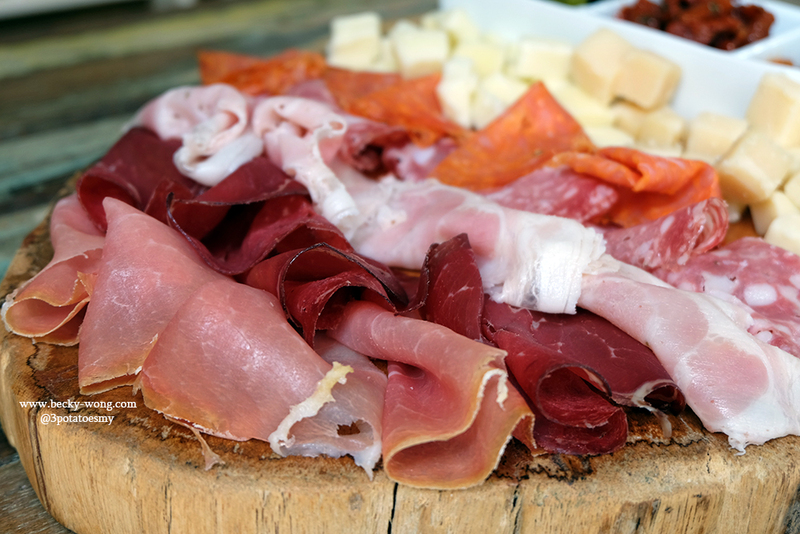 I love cold-cuts and cheeses. 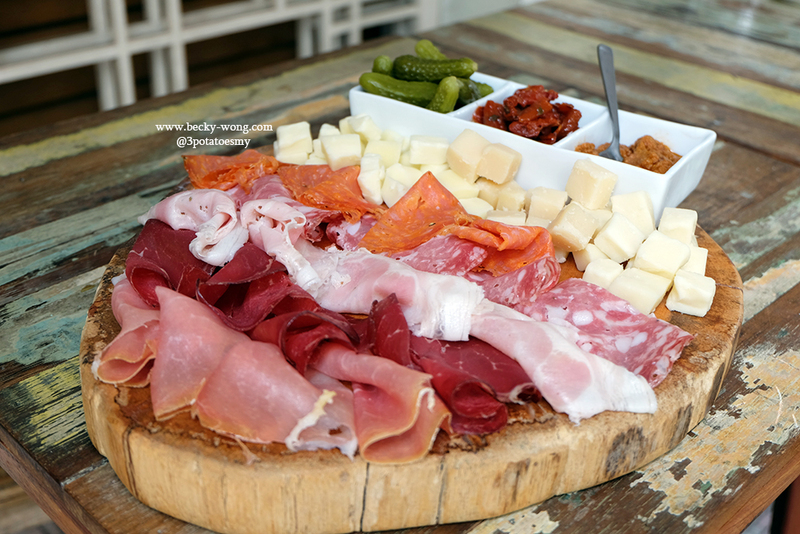 So, you can only imagine the excitement in me when I saw this Charcuterie Platter (RM 51.95 - 2pax). 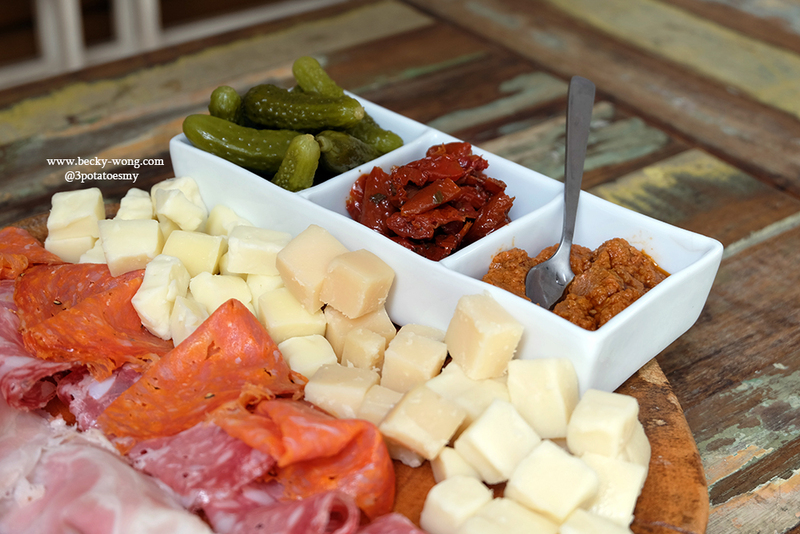 Served with 3 types of cured meats (Parma, Porchetta, Bresaola), 2 types of salami (Salame Napoli, Spicy Salami), 3 cheeses (Grana Padano, Provolone, Toma), with pickles & sauces at the side (Sun-dried Tomatoes, Gharkings, Red Pesto Sauce). Honestly, I can't decide which my favourite was because I really really do love all of them! 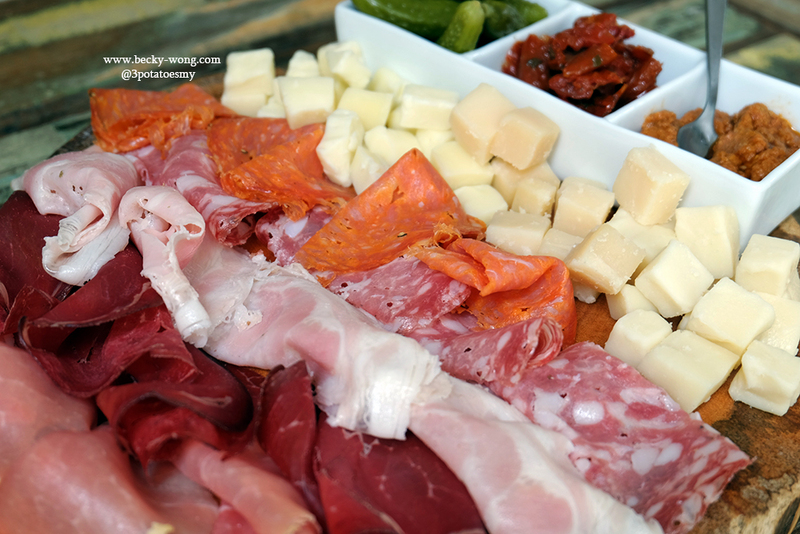 These cold-cuts and cheeses reminded me of my school days, where I used to have them with bread. It was so simple and delicious! If I have to choose, the sun-dried tomatoes and red pesto sauce would be my favourite. But then again, I'm never a fan of pickled food. Parma Sandwich (RM 23.30). 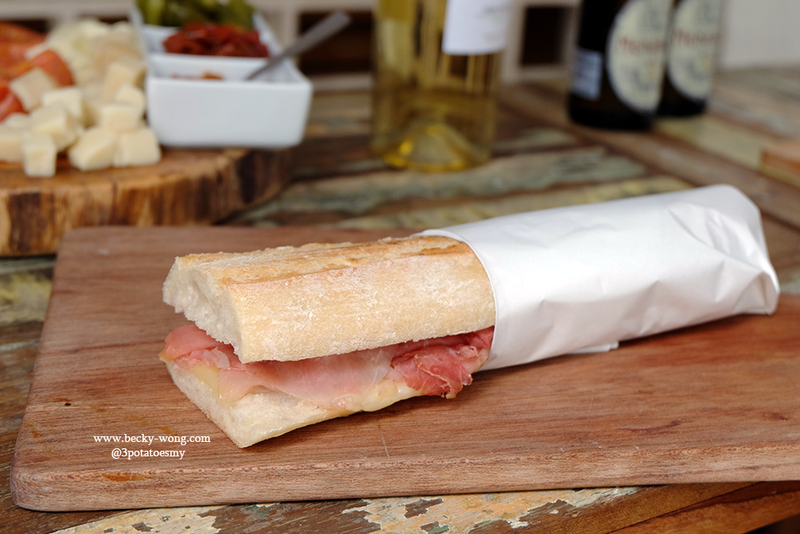 This is what I was talking about - cold-cuts and bread! 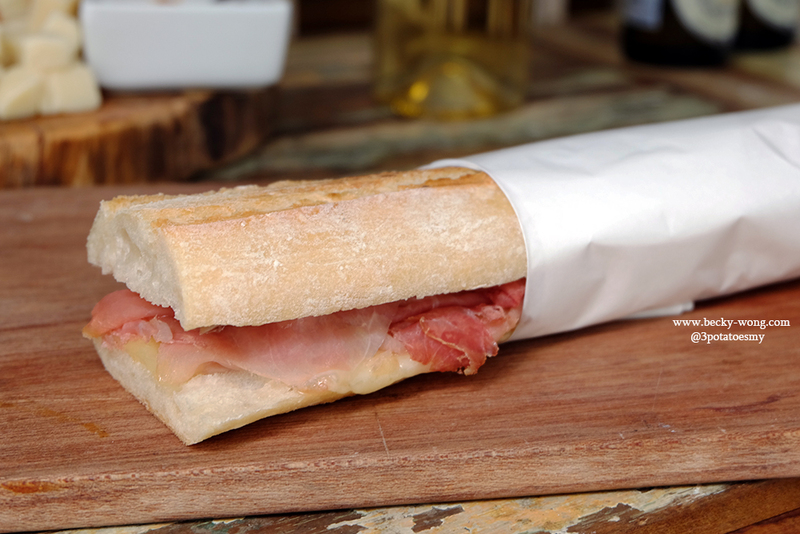 A simple sandwich comes with Parma, Fontina cheese and artichoke - total delish and perfect for breakfast or lunch! 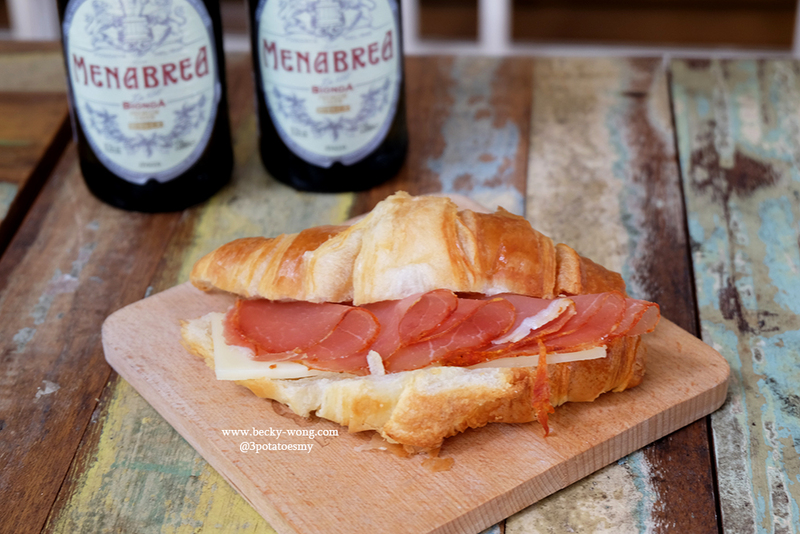 Croissant with Ham (Lomo Iberico) & Cheese (Asiago Cheese) (RM 18). Flaky, buttery croissant served with savoury Lomo Iberico ham and Asiago cheese. Wish I had more of this! 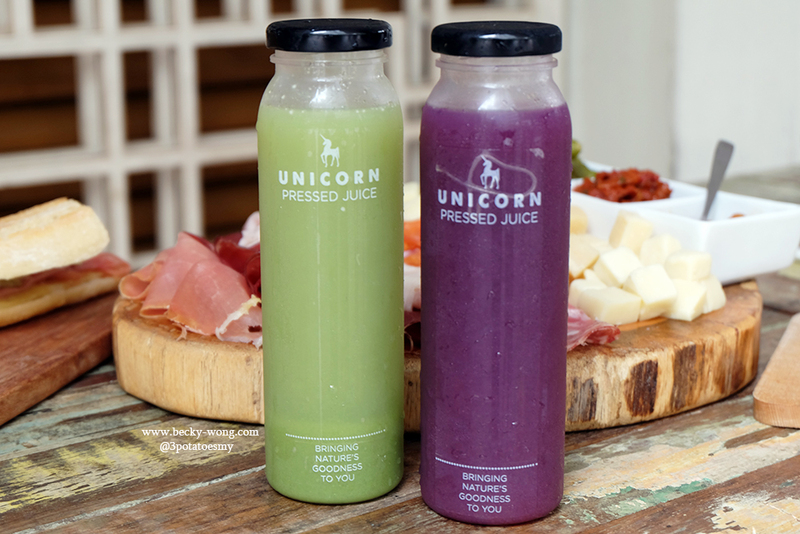 Cold-pressed Juice - Green (L), Scarlet (R) (RM 15.90). Green was light and refreshing, but I still couldn't accept the taste of celery and bittergourd. On the other hand, I really like the hint of sweetness and earthiness of beetroot in Scarlet. Mebabrea (RM 23.32). 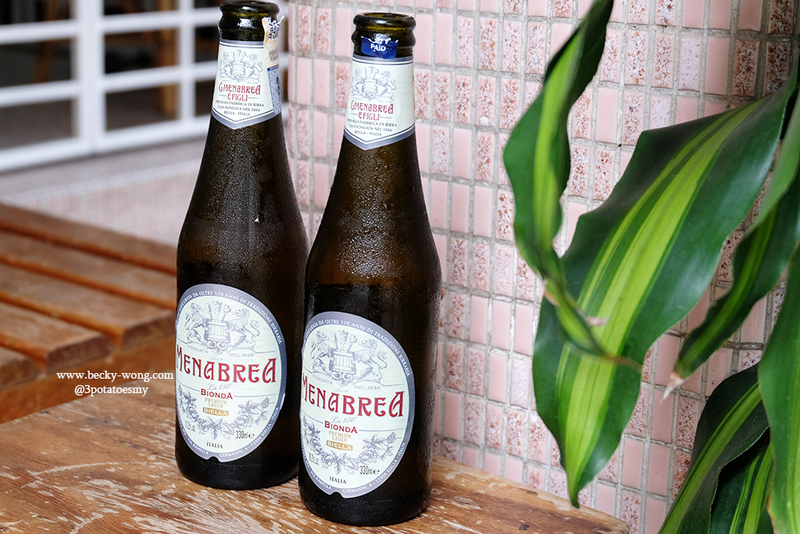 This Italian beer was light but smooth. Seriously, I could use one of these recently, thanks to the hot weather! Compared to beer, I prefer wine more. 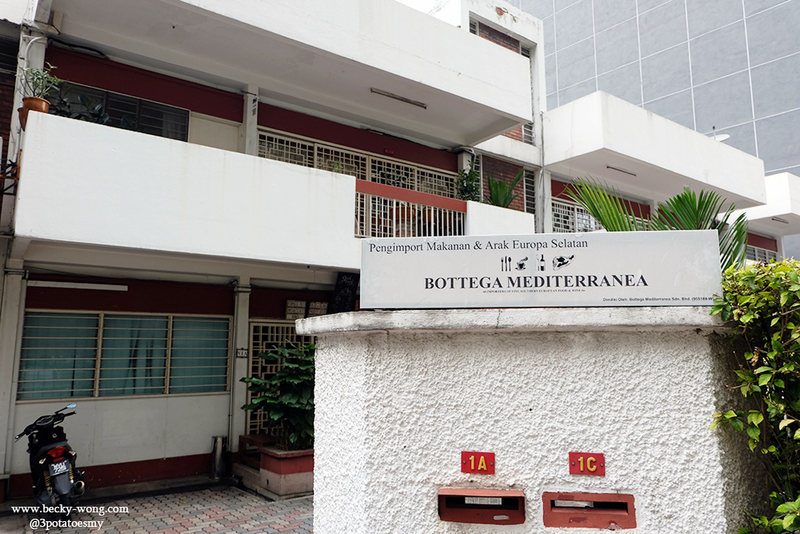 Sadly, we did not get to try any of the wine at Bottega Mediterranea. Maybe next time. Though is a deli, there is a small corner at the back of the shop with 4 tables for those who like to sit back and relax, while enjoying their food. 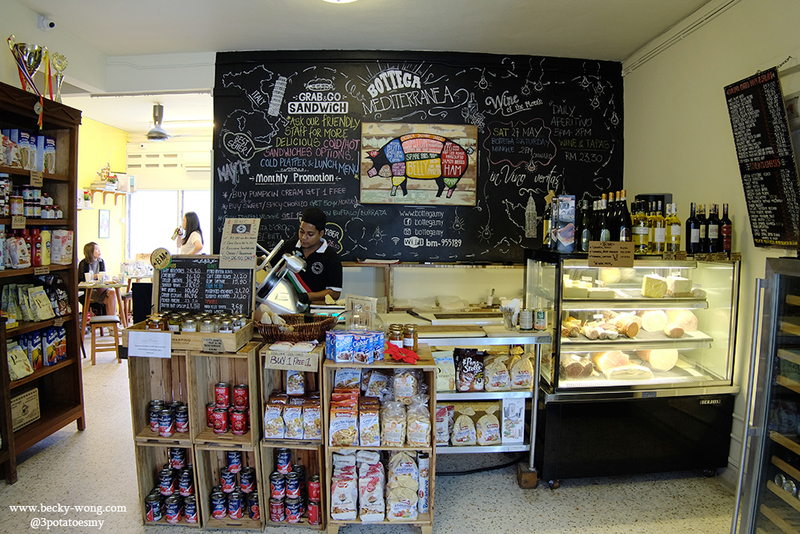 Bottega Mediterranea might not have a wide variety of grocers, but you'll find good quality products at the shop. 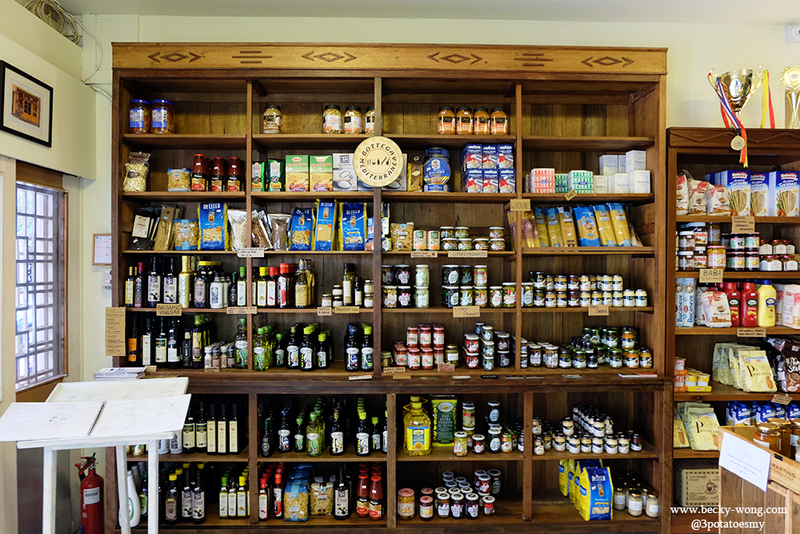 No matter if you want a cosy place to chill or looking for a place to buy quality products & products, this friendly neighbourhood deli might just be the place for you. 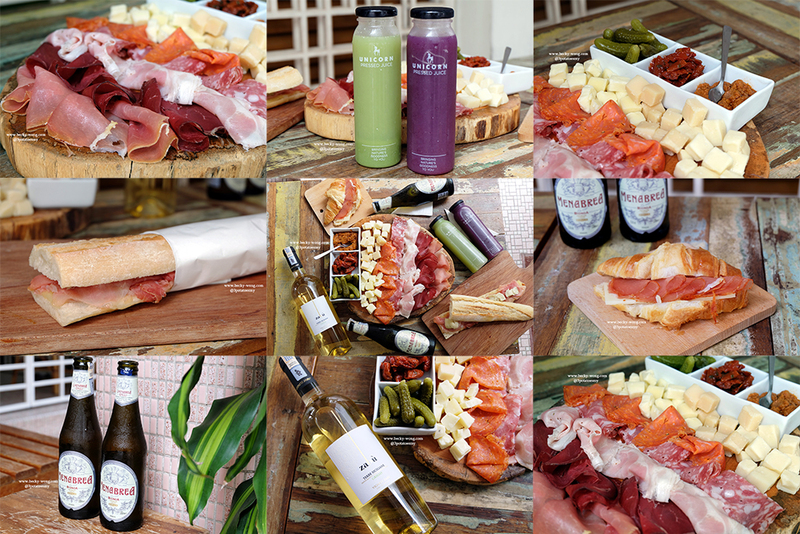 To know more updates on Bottega Mediterranea, check out their Website, Facebook, and Instagram.